The darkest disasters in both Mother Nature and human nature have occurred since the dawn of time, and now it seems that the �natural disaster of the century� occurs almost every year. Thankfully, few of us will ever face a tragedy that strikes with the strength and speed of a tornado or tsunami or with the ferocity of a flood or forest fire. Yet most of us do indeed confront crises, real or imaginary, that can change the course of our lives in a heartbeat. This inspiring book presents the author�s spirit of resilience throughout a lifetime of challenges and triumphs from both a professional and personal perspective�from an orphanage in Canada to a scholarship in the USA; from her adoptive parents deaths from cancer when she was 21 to her own experience as a cancer survivor; from arriving in Australia jobless to joining IBM and being named Australian Executive Woman of the Year and Keynote Speaker of the Year and honored to carry the Olympic torch during the opening ceremony of the Sydney Olympics. During waves of change or winds of woe, when our clarity of thinking vanishes in a mist of tears, lessons from a wondrous array of natural resources can help us clear the mental fog and better cope with the challenges. 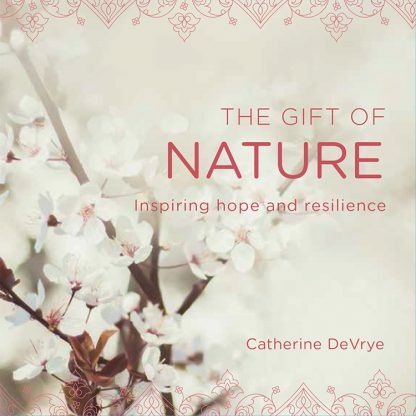 The Gift of Nature applies the timeless wisdom of Mother Nature to human nature, offering readers strength through nature photographs and inspirational quotes from an author who has bounced back from setbacks time and time again. Catherine DeVrye, a former Australian Executive Woman of the Year and Australian Speaker of the Year, combines Gen Y energy with baby-boomer experience to deliver an entertaining and educational message on the international professional speaker�s circuit. Her autobiography, Who Says I Can�t? was nominated for Australia�s National Biography Award. As a former IBM executive, Catherine held roles in sales, marketing, communication, and management development. She is a former board member of the third largest police service in the world, a past CEO of Young Achievement Australia, and she worked for federal ministers of consumer affairs, education, and sport, where she was involved in the establishment of the Life. Be In It fitness campaign.